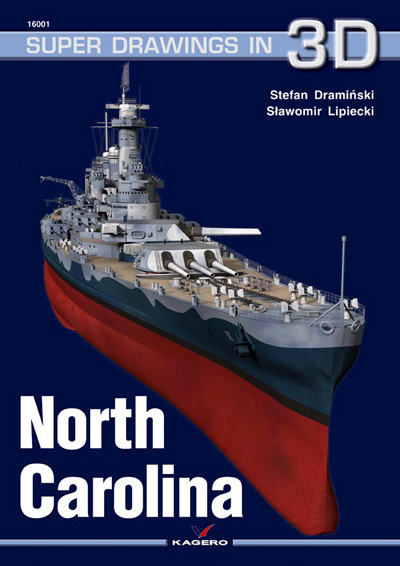 The construction of the USS North Carolina was preceded by a number of model tests carried out in a special Taylor deck. The results made it possible to determine the hull’s drag and the power plant needed to reach a speed of 27 knots at battle displacement as was estimated in the project. The tests led to the development of a relatively long hull (222.1 m) with slender theoretical lines which caused some problems while designing the ship’s interior. To reach high stability and to increase the level of underwater protection, the hull was equipped with up-to-date streamlined anti-torpedo bulges. These bulges were over 1.3 m wide on each side of the hull. Starting at a lower edge of the board armor, they extended as far as the triple bilge. As with older ships, the board armor was mounted to the side plating. To reduce the hydrodynamic drag, impacted by the board armor mounting and bulges, a large cast bow bulb was mounted. To avoid flooding of the bow deck, a special raked stem was designed (a slightly different design from older battleships) with widely open bow frames at the top. To ease the waterflow and to improve explosion durability of the shaft and propeller system two solid skegs were mounted at the stern. These were specially strengthened under-hull covers enclosing the end parts of the inner propeller shafts. There were two end pieces of outer drive shafts running on both sides of the skegs (one on each side). In their stream there were two solid rudder blades mounted with the area of 28.1 m2 extending over 36.5 degrees towards each of the boards. This resulted in the creation of a hull with very good naval characteristics at battle (44,795 ts) or full load displacement (46,800 ts). The battleship was navigable and easily manoeuvrable. At the maximum speed of about 27 knots a complete turning radius was merely 625 m, which made it one of the most easily manoeuvrable battleships in the world. As with earlier US Navy battleships, the hull’s beam reached its maximum not far from bow and stern. This shape and construction enabled, amongst others, the ability to deepen the port and starboard anti-torpedo defence systems and its unification on particular frames8, and proved its worth over many years of service when the ship was at a sea for months in all possible weather conditions – even in hurricanes and typhoons. Deep draught (ca. 10.5 m at battle displacement) and a beam of 31.852 m at the waterline made the USS North Carolina a very stable artillery platform, a characteristic feature of the majority of American battleships. The outer hull plating comprised sheets of special 19‑25 mm STS armored steel (homogenous), and 16-19 mm thick tensile strength (HTS) steel was used for underwater sections. There were six decks on the ship: main deck – bomb deck, second deck – main armored deck, third deck – plunging fire deck, two discontinuous platform decks (called first and second respectively), and a hold water deck. The distance between the decks, with the exception of plunging fire deck, reached 2.52 m (2.41 m at the edges, near the boards). Innovative and compact turrets were designed for the USS North Carolina to enable the ship’s guns the widest possible firing angles. The vessel was a formidable weapons platform – with all of her main and subsidiary guns in action, the North Carolina could bring a full complement of 128 gun barrels to bear. Along with the associated and modern opto-electronics this made cabin space very limited. There was a solid, elliptic main command post tower in the frontal part of the conning tower. The inside of the tower and the citadel were connected by a 406 mm (16”) communication tube. The main command post was partially built over by a navigation bridge with a wheelhouse. At the top of the bridge there was an Mk-37 sight director to control secondary artillery fire (as well as main artillery if need be). Unlike other types of American battleships, the bridge was not paned. There was only a row of slightly bigger than usual portholes, with special steel plunging fire covers on the outside. Mounted atop the large fire control tower was a bow Mk-38 sight director for the main artillery. Not far from the bow conning tower there were two relatively thin standalone funnels for exhaust gases from the boilers (the first funnel was the slightly taller of the two). On both sides of the first funnel was located a Mk-38 sight director for controlling main and secondary artillery fire. Caps were fitted to the tops of both funnels to direct exhaust fumes towards the stern and protect fire control posts from smoke. The space between the funnels was initially used to mount boats and launches. At a later stage they were replaced with 40 mm (1.75”) L/56 Mk-2 Bofors anti-aircraft guns and their associated sight directors and fire control radars. On the roof of a small stern conning tower another main artillery Mk-38 sight director was installed. It was based significantly lower than the one at a bow to protect the fire control post from smoke and the necessity to reduce the so called lifted weight. At the very end of the stern conning tower there was an Mk-37 long-range fire control sight, and on its sides the were solid cranes used for the lifting and lowering of boats. Interestingly both of these heavy devices survive on the battleship up to this day, although all life boats and launches were removed at the start of the Second World War. The USS North Carolina’s armor was to fully protect the battleship against 356 mm (14”) Mk-16 projectiles fired from Mk-10 and Mk-11 guns and 406 mm (16”) Mk-5 projectiles fired from Mk-5 L/45. 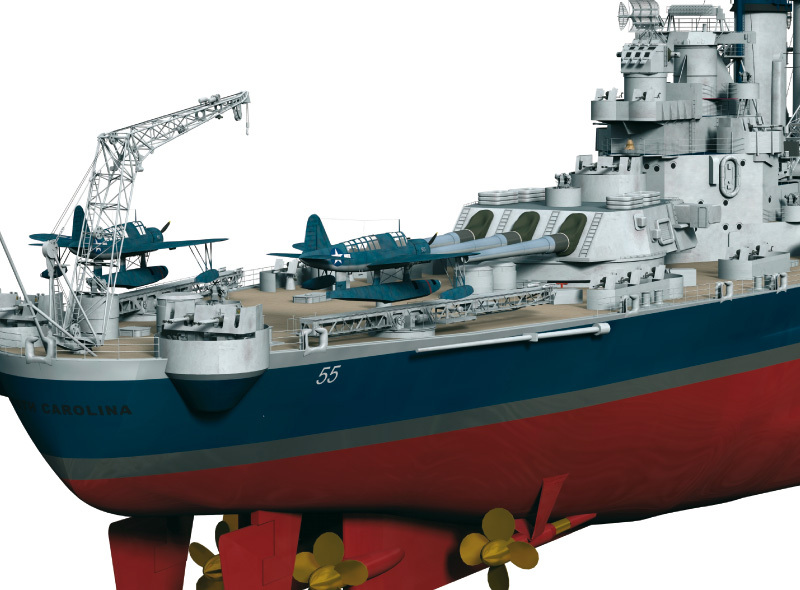 The development of heavier Mk-8 APC projectiles and the new Mk-6 L/45, Mk-8 L/45 and Mk-7 L/50 guns in June 1939, caused the necessity of strengthened the ships’ passive defence. However, it was too late to introduce major adjustments to the design and new battleships were not fully defended against new types of projectiles. It has to be remembered, though, that the latest American heavy guns were exceptionally powerful weapons and there was no match for them in the world. Bearing this in mind, the North Carolina’s armor deserves the highest grades, especially that many of its elements could not be damaged with the latest guns. Main 305 mm (12”) thick [under water, 1.6 m off the lower edge, the thickness decreased to 168 mm (6.6”)] and 5.5 m wide belt armor made of A3 class armor based upon „all or nothing” system was 136 m long. Starting at the front of main artillery gun turret number 1’s barbette, it ended at the stern barbette of tower number 3. The ship’s side armor was angled outwards 15 degrees to increase its effective thickness against incoming enemy shells.. Armored sheets were bolted to the side plating (19 mm of STS steel) with huge double-sided bolts made of NS steel, welded at nuts on both ends. There was a 50 mm wide gap filled with concrete between armored sheets and side plating, which served as a sealer. Near the ammunition chambers behind the main board armor, there was yet another belt, 95-51 mm (3.7-2”) thick, inclined by 10 degrees. There were two vertical cross bulkheads, 282 mm (11.1”) thick, protecting the citadel at the bow and at the stern. From the very beginning, North Carolina was designed for medium and long distance combat, and an appropriate system of horizontal armor was incorporated. The first (upper) deck was designed to cause the detonation of lighter bombs and projectiles, before they could reach the second (main armored) deck. It was 37 mm (1.45”) thick and was made of STS steel. The second deck, that is the main armored deck, was constructed from a combination of 92-104 mm (3.6-4.1”) B2 class special armor and 36 mm (1.4”) STS steel. Its function was to stop (shatter or damage) heavy bombs and armor-piercing projectiles before they reached the lower deck. The third (lower) deck was made of 16-19 mm (5/8-3/4”) STS sheets. Its function was to stop the remains of the projectile, minimize the explosive’s effects and catching the shrapnel which could be propelled off the construction elements of the main armored deck. At the stern, near the steering gear, the lower deck was covered with two layers of sheets: 166 mm (4.6”) STS on top of 36mm (1.4”) STS. The main armament and turrets were very heavily armored. The barbettes were made of 406 mm (16”) A3 class armor, sides of turrets of 249 mm (9.8”) on 19 mm (3/4”) STS plating, rear walls of 300 mm (11.8”) on the same kind of plating; the roofs made of 178 mm (7”) B2 class armor were attached to solid MS steel girders with 19 mm STS plating. Amazingly thick (406 mm of superior B2 class armor on 19 mm STS base), inclined at 35 degrees turrets’ front plates need to be noticed. The main command post was also heavily armored. There was 406-373 mm (16-17.7”) thick armor on the sides and 178 mm (7”) B2 class armor plating on the roof. Secondary artillery gun turrets were equipped with light, 49.5 mm (1.95”) thick armor, the pilot house and navigation bridge were covered with 51 mm (2”) armor, and there was 37 mm (1.47”) plating protecting funnels, conning tower and sight directors. All these elements were made of STS Mode 2 class steel armor.